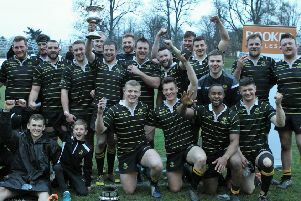 Jed Thistle made it two wins in two weeks by beating Gala Wanderers 30-21 in the final of the Kelso Quins Sevens, played at Poynder Park on Saturday. Round three of the Borders Semi-junior Sevens Series saw the young Jed side taking the lead in the eight-tournament competition. The semi-finals saw holders Melrose Wasps go down 12-5 to the eventual winners in a thrilling game, with Hawick Wands falling to Gala by 22-5. Jed scrum half Calum McNeil was named man of the tournament. With five rounds to go there is plenty of time for things to change. Next week, Hawick Wanderers are the hosts at Volunteer Park. Jed Thistle squad: Robbie Yourston, Robbie Douglas, Aiden Walker, Calum McNeil, Rory Smith, Craig Cowan, Rory Marshall, Stephen Smith, Elliot Stewart and Kyle Amos. Results – first round: Selkirk Youth Club 38 Peebles Colts 10; Melrose Wasps 48 Berwick Colts 0; Hawick PSA 21 Kelso Quins B 10; Jed Thistle 41 President’s VII 0; Gala Wands 36 Duns Colts 5; Morpeth Colts 24 Musselburgh 0; Kelso Quins A 36 Edinburgh BATS 0; Hawick Wands 40 President’s VII (2) 0. Quarter-finals: Melrose 17 Selkirk Youth Club 7; Jed Thistle 46 Hawick PSA 5; Gala Wands 15 Morpeth 5; Hawick Wands 24 Kelso Quins A 19. Semi-finals: Jed Thistle 12 Melrose 5; Gala Wands 22 Hawick Wands 5. Jed Thistle 30 Gala Wands 21.